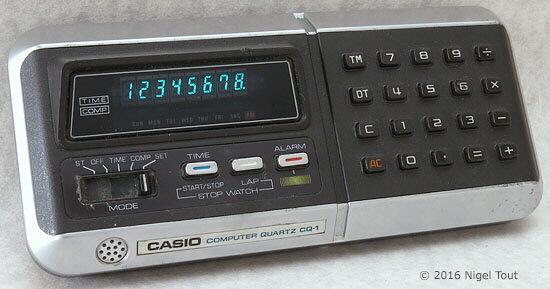 Casio CQ-1 "Computer Quartz" calculator and clock. Distinctive features: Electronic calculator, alarm clock, stop-watch, time and date calculations. Display is 8 digits, blue VFD (Vacuum-Fluorescent Display). 4-function, stop-watch, alarm clock, date, time and date calculations. Date calculations from 1901 to 2099 (so is Y2K compliant), taking leap years into account. It can calculate the number of days between two dates. Calculator/watch electronics 2x silver oxide button cells, VFD display 1x AA battery. Size 142 x 63 x 31 mm (5.6" x 2.5" x 1.2"). The two button cells are used to power the clock and the calculator functions but not the display, which requires the AA battery or an AC adapter. The life of the button cells is stated to be about 1 year, but the AA battery will only illuminate the power-hungry VFD display for about 10 hours. However, the display can be extinguished by setting the MODE switch to "OFF", and then the time can be displayed by pressing the "TIME" button. Alternatively, the clock can be displayed indefinitely using the AC adapter. The CQ-1 in hand showing its small size. To distinguish their calculators from the crowd, manufacturers started to add extra functionality beyond the normal calculator functions. 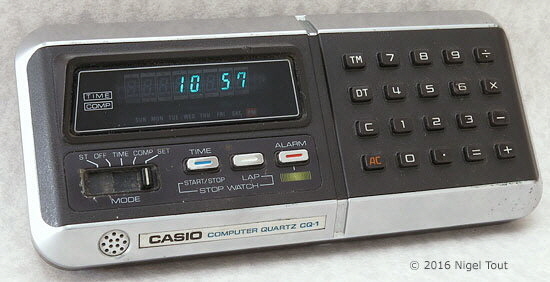 Such is the case with the time mode of the Casio CQ-1. 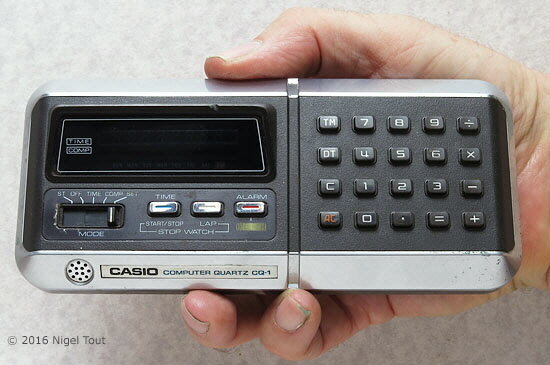 By 1976 the electronics for calculator and time functions had shrunk to fit in a small hand-held calculator that could be powered for a year by two button cells, but the VFD display used in the CQ-1 was still very power hungry and limited the usefulness of this machine. This was solved by the use of an LCD (Liquid Crystal Display) in the Casio MQ-1, introduced in 1977, which allowed the use of just the two button cells and allowed a great reduction in size.